Yellow and white is the perfect color combination to jumpstart spring. 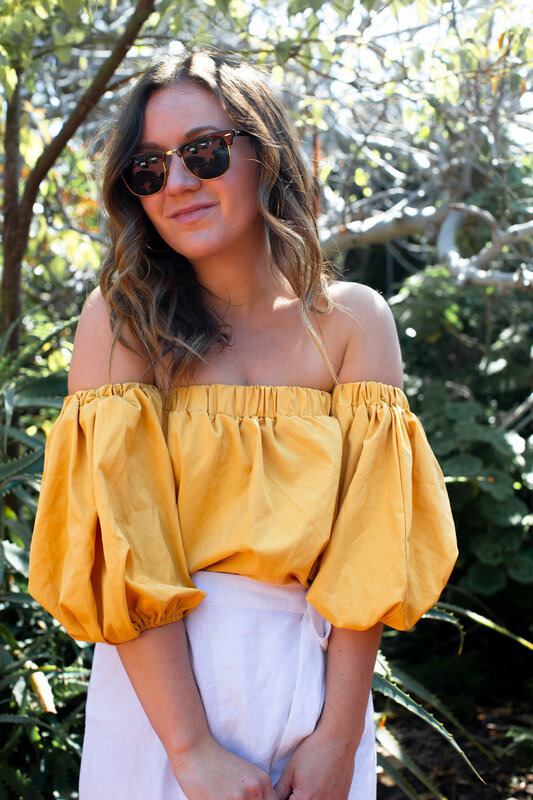 I found this yellow off the shoulder top when thrift shopping last week and fell in love with this vibrant color. I don’t usually wear much yellow, mostly because the color can be too harsh on a lot of skin tones. This yellow however is the exception to that rule. The reason this shade of yellow works is the warm undertones and saturated shade. It actually makes me look tanner rather than washed out making it perfect for spring and summer. White linen has been a favorite fabric of mine as of late. I love the thicker texture, breathability and casual luxeness. The new collection for Magill Clothing that is launching at the end of this month has lots of linen alongside chambray and yellow prints - three of my favorite colors this spring. More details will be coming shortly as we get closer to launch. In the meantime, all our Pre-Spring Magill pieces are on sale for 20% off, so make sure to check it out!